Wireless 802.11ac draft routers are coming thick and fast, and the Netgear D6300 802.11ac dual band gigabit Wi-Fi modem router is in fact an ADSL2+ equipped version of the Netgear R6300. For UK and European countries that largely use copper-based ADSL, rather than cable DSL, this represents the first all-in-one device that can provide a complete communication solution from a single unit. It's the stuff of dreams for the purist, or just people who hate cables. As always, the bee in our bonnet - that we're happy to flog to death like a tiny buzzing horse - is that this is all based on the draft release of the 802.11ac standard. The fact that all routers seem to be using the Broadcom 4360 chipset does mitigate incompatibilities. But things like Netgear putting the delightful small-print disclaimer on the back of the D6300's box stating "NETGEAR makes no express or implied representations or warranties about this product's compatibility with future standards" doesn't do anything to allay early adopters' fears. More pressing is the fact that even at the end of 2012 there are still no 802.11ac capable laptops to take advantage of this speedy standard. We understand that Netgear is about to launch its Netgear A6200, the first 802.11ac USB adaptor, but it'll only be USB 2.0, making something of a mockery of any claimed speed increases. This environment not only hinders testing, but also restricts use in the home or a professional environment. In fact, the only way of using these is to buy two of the Netgear R6300 or Netgear D6300 routers and bridge one to the other. It's this type of thing that makes it hard to recommend any draft router solely based on its performance. At least one area that we're interested in is to see if there have been any speed increases from the release of the older Netgear R6300 and this more recent Netgear D6300. One aspect of draft products is that refinements in firmware and hardware tend to see incremental increases in speed as newer hardware is released. This is another good reason for holding back on early adoption. This Netgear D6300 retains the enormous chassis design of its Netgear R6300 brother. Stood upright, it's 255mm wide, 205mm high and 77mm deep (10.04 x 8.07 x 3.03 inches). It's by far the largest router we've ever seen, and for no obvious reason, since it's far larger than any other 802.11ac router. 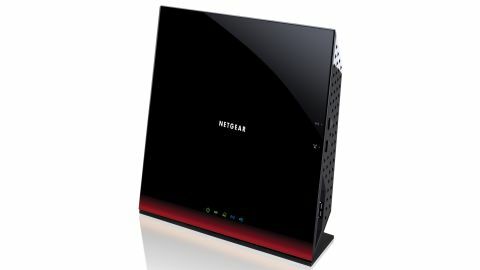 At least Netgear has swapped the gaudy gold pattern of the R6300 for a more subdued red one. Another issue we had, related to the size and design, is that it's awkward to reach the rear-positioned ports and power button. They're recessed into the huge case, and you have to reach around to find them, while it's tricky releasing the catches on Ethernet cables. Far more accessible are the side-mounted WPS and Wi-Fi toggle buttons, so you can quickly switch off the network entirely. Negatives aside, the router does come with four Gigabit LAN ports, one WAN and two USB 2.0 ports. For this Netgear D6300 router there's the integration of an ADSL2+ modem and RJ11/phone port. The USB ports support the usual NAS, printer and DLNA media sharing. The NAS supports FAT16/32, NTFS and EXT2/3, which covers all the main file systems you'd want. One area the specification differs from the Netgear R6300 in is its 1300 + 300Mbps support. Oddly, the 2.4GHz capabilities are downgraded to just support 300Mbps rather than 450Mbps. The 5GHz network still offers full 802.11n 450Mbps and 802.11ac 1300Mbps. It's just you 2.4GHz luddites that get the stick in the eye on the performance front. Installation is a breeze thanks to the new web-based interface. This can automatically pick up any WAN configuration for you or you can opt for a manual approach. The new front-end takes a friendly, colour-coded approach and offers a quick status overview of the internet, wireless, parental and security settings. Delving deeper, the settings are logically split into basic and advanced sections, while the 2.4GHz and 5GHz bands can be configured separately. There is a bridge and repeater mode that can handle up to four repeaters, along with a main base-station. It uses the same awkward bridge configuration as the Netgear R6300, but once you know where the advanced settings are, along with the MAC addresses, it's straightforward enough. A Guest network mode has already been added, which provides internet access but no local network access to wireless users. Netgear also provides decent parental filtering that can be provided on an automatic and keyword basis, making use of the OpenDNS system. There are also comprehensive logging, scheduled power and access times, plus a bandwidth monitor. Netgear now also offers a new iOS and Android app to provide local control and access, too. We've always found Netgear interfaces to be fast and easy to navigate. This newer interface, while not as flash as say the Fritz!Box 7360 or Asus RT-N66U Dark Knight offerings, is a pleasant update and provides comprehensive features.